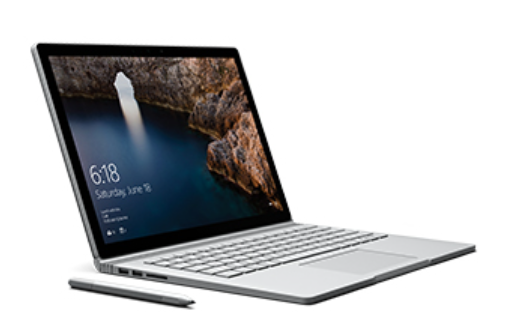 Microsoft Surface Book, the ultimate laptop is now more powerful than ever. The new Surface Book with Performance Base has been redesigned from the inside out with twice the graphics performance and 30% more battery life. Surface Book is built for performance. Detach the screen with the push of a button, turn it around, and reattach to share content and presentations. Interact with Cortana using only voice commands. Perfect for watching a movie or your favourite shows. Surface Book is a sleek, portable powerhouse. Use demanding apps and tackle complex tasks on the go with up to 16 hours of battery life. Get productive with a full keyboard and large trackpad, or use the interactive touchscreen. Detach the stunning PixelSense™ display with touchscreen to transform Surface Book into a thin and powerful Intel® Core™ i5/i7 tablet you can take anywhere. Fold Surface Book into Studio Mode to draw and sketch in a comfortable, natural position. Add Surface Dial, Pen and touch for an immersive creative experience.